Desperate times call for desperate measures, and California’s severe drought is already inspiring a few. 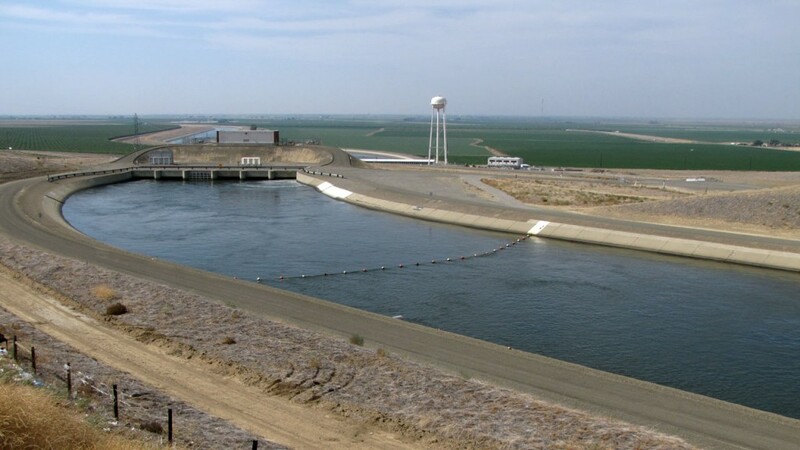 Water districts in the San Joaquin Valley are proposing a drought tactic that’s never been tried: they want to reverse the state’s plumbing by running the California Aqueduct backwards. The aqueduct is the main artery of the state’s water system. It stretches more than 400 miles, connecting the northern part of the state, where most of the rain falls, to the southern half of the state, where most of the demand for water resides. It was built a half century ago, when California engineered its huge network of reservoirs and canals. The aqueduct was designed to go in one direction – north to south. Until now, that is. “This is a year where I’m doing a lot of things I’ve never seen in my career,” says Jim Beck, general manager of the Kern County Water Agency, which provides water to 13 districts in the southern Central Valley. The agency is putting together a plan to run up to 47 miles of the California Aqueduct backward, something unheard of in any other year. Several agricultural water districts, including Lost Hills, Berrenda Mesa, and Belridge Water Storage District, are in a tight spot this year because their sole water supply comes down the aqueduct via the State Water Project. Given the lack of rain and emaciated Sierra snowpack, state officials have warned that districts will only be getting five percent of their normal deliveries. And that water won’t flow until September. “Without water from the State Water Project, they are 100 percent reliant on other sources of water to keep their trees alive and permanent crops, which make the majority of farmland in those areas,” says Beck. Reversing the aqueduct would provide water for those northern water districts. The water would have to fight gravity, because the aqueduct runs ever-so-slightly downhill. “The reason we can even consider this is the slope of the California aqueduct is so gradual,” Beck explains. Up to twelve diesel pumps, each the size of a large truck engine, would be installed temporarily. All together, they could move almost 8 million gallons of water a day. “Our hope is that we’d get them installed at the beginning of summer and really meet a significant need of our growers,” says Beck. The project could be in place by July 1 and would cost up to $10 million dollars. Kern County is considering the plan because of the large water supply stored in their groundwater banks. The banks are essentially underground reservoirs. “We’ve got groundwater, probably at about 175 feet and going down about a foot a week,” says Harry Starkey, general manager of West Kern Water District, walking across a field in southeast Bakersfield. His district is just one of many that use the groundwater bank. In wet years, they recharge the groundwater basin with extra surface water. “We just spread it out over the land and it infiltrates at about a half a foot per day, generally,” he says. Then, the water is pumped out in dry years. Water districts north of the groundwater bank aren’t close enough to the "ATM," so to speak. During a normal year, they’re able to use the bank by doing a “water swap.” The water districts let another district use water they've stored in the bank. They then take that’s district’s water directly from the California Aqueduct -- when there's water to be had. “Certainly it will work, but there have to be certain conditions met,” says Carl Torgersen, deputy director for the State Water Project. “Any of the downstream users cannot be injured or harmed by this.” The local air quality board will also review the emissions from the diesel pumps. Torgersen says the project is only one of the unusual ideas being floated this year to cope with the drought. “Our director recently sent out a notice to the various state contractors that we certainly are, in fact, open to any ideas that they might have that we can accomplish,” he says. With this year’s Sierra snowpack melting quickly, getting creative is more of a necessity than a choice.